The Cheeky Tui is a character-filled property perfect for families. The house is sheltered, sunny and quiet with a large, grassy section. Well behaved and house-trained dogs are more than welcome. There's a Kent fire and heat pump for winter so the house is lovely and warm. The Fidgety Fantail holiday home, (also owned by us) is next door making it perfect for 2 families or friends to rent one each. There's room for a boat and lots of space for children to run around and play. New covered outdoor eating area with great indoor, outdoor flow. The property is fenced and has many extras; slide and climber, swings, bikes, kayaks, DVDs, lego and duplo,board games and atmosphere. Portacot provided. TV and phone. Use this home as a base to see Rotorua sights as well as using the lake environment. Our friends have a luxury pontoon boat for Lake trips and they offer a 20% discount for guests. Close to good swimming spot on Lake Tarawera. All day sun. Close to boat ramp. Duvets, pillows and blankets are provided but guests are requested to bring their own sheets, pillow cases and towels. We ask that visitors leave the property clean and tidy. We are Martin, Caroline, Andrew, Mikey and Juliet. Welcome to our little bit of NZ paradise. On a trip to New Zealand in 1998 we fell in love with Tarawera, so much so that when we moved to the country permanently, we vowed to eventually have our own property there - a reason to escape the city and recharge our batteries. We were lucky enough to find the Cheeky Tui and Fidgety Fantail and since 2013 have been sharing our piece of paradise with wonderful guests from near and far. Fully self contained log house in a garden setting next to a reserve. 5 mins walk to boat ramp and a good swimming beach. We ask that guests provide their own sheets, towels and pillow case, however these can be provided if required for $25 per person per stay. a single and double provided, along with paddles and life vests. Not state of the art but good for a play around. We loved staying at the property and was a great price. Good facilities and lots of character. Thanks for letting us stay with our dogs. Woof! This place is so inviting. A real Bach feel. Comfortable & relaxing. Easy walk to the crystal clear waters of the lake. Great spot for a family holiday. Even the weather played ball this year. Had a great stay. Was very peaceful spot. Clean and tidy, everything needed was supplied. Overrule a great stay. 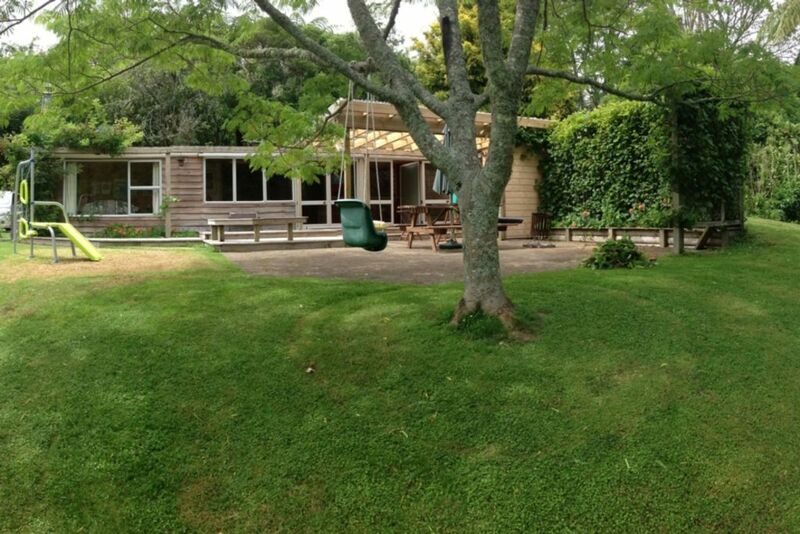 The house is located 20 mins out of downtown Rotorua along a beautifully scenic lakeside road. Close enough to pop in and enjoy all of the town's attractions, yet far enough away to escape the wonderful thermal smells! Lake Tarawera offers boating, fishing, mountain biking, walking and general escapism and relaxation - there's nothing better than throwing a steak (or veggie alternative) on the bbq and relaxing under the stars with a cold drink after spending the afternoon sightseeing in Rotorua. A trip across the Lake from the Landing Cafe to Hot Water Beach on one of the water taxi's is an unforgettable experience. For those of you with more energy, why not take the 3 hour walk instead and catch the water taxi back. Tarawera's explosive history can be explored at the buried village down the road which explores the regions past before (and after) the 1886 eruption of the mountain. Luckily you're more likely to be hit by a flying wallaby (yes, they do exist in the bush there) than a volcanic rock these days. This is New Zealand's countryside in it's most pristine and peaceful state. Nature, heritage, serenity and some much needed sanity. One coffee sat by the lakeside watching the ducks, swans, trouts and kingfishers can undo a world of tension and stress! For those extended family stays, we also own the Fidgety Fantail next door which sleeps 9 and can also be found on this site. Between the two houses we can accommodate up to 16 guests.